The news programs and blog sites have been a buzz recently about Congress declaring Pizza a vegetable. Not some eggplant, pepper, spinach, and broccoli laden version of pizza. What was being referenced was your typical school lunch slice of pizza. Well, despite the reactionary tone, Congress didn’t exactly make this declaration. They did do something nefarious to anyone who wants kids to get nutritious school lunches, though. Currently, an eighth of a cup of tomato paste counts as if it had the same nutritional value as a half cup of vegetables. Most other veggies need to be half of cup’s worth before they are counted as a serving. The Obama administration wanted to remove the tomato paste exception. Congress blocked this. Some, mostly the food companies, hailed the decision pointing to the fiber and other nutrients that tomato paste contains. I’ve used it in my cooking from time to time, too. So I wondered. How nutritious is it? I got to thinking that the best thing to compare tomato paste with are actual tomatoes. After all, tomato paste isn’t claiming to be zucchini or spinach or apples or oranges. So why stack it up against those. Let’s see how 1/8th cup of tomato paste compares to 1/2 cup of tomatoes. Thankfully, Calorie King let me easily look this information up. 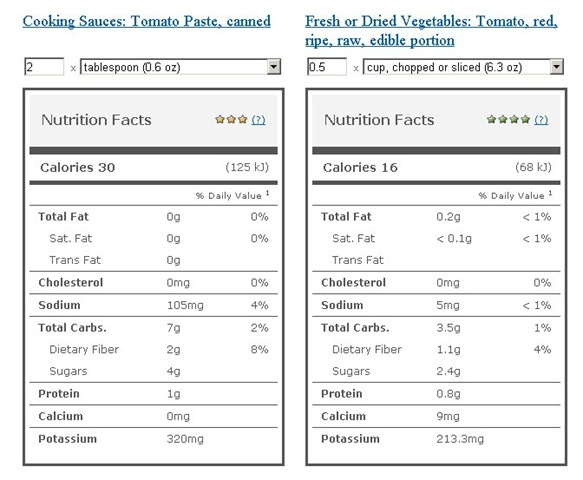 So 2 tablespoons (1/8th of a cup) of tomato paste contains nearly twice the calories and much more sodium as the “equivalent” (as defined by Congress) amount of chopped tomatoes. (They could use low sodium tomato paste, but let’s be honest here. They’ll likely use the regular stuff.) It also has nearly twice the sugar, twice the carbs and none of the calcium. Tomato paste does best chopped tomatoes when it comes to potassium and slightly beats it out in dietary fiber. 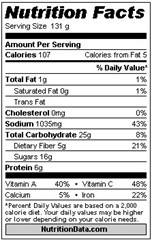 Still, I don’t think the calorie/sodium/sugar tradeoff is worth less than 1 gram of added fiber. Tomato paste clearly doesn’t stack up, but perhaps it has more vitamins? Calorie King didn’t display this information, so I found another website, Self Nutrition Data, that did. Now, here is the information for 1 cup of chopped tomatoes. You can see that tomato paste still falls short in vitamins A and C. It has a slight lead in calcium which is interesting given that Calorie King showed it as having 0mg. (I’m guessing that was due to rounding for a 1/8th cup serving.) It also has a decent lead in iron. So, should pizza (or, more accurately, tomato paste) be defined as a vegetable. Most certainly not. First of all, there is the nutritional data that I showed above. Perhaps, the best reason comes from NHL, though. My third grade son, upon hearing this, declared: “But tomatoes are fruit, not vegetables!” He’s right. They are. You might as well declare apple pie a veggie. Perhaps we need to hire Jeff Foxworthy to run a special of his TV game show for Congressfolks. We’ll call it: Are You Smarter Than A Third Grader?